Last week the New South Wales Legislative Assembly unanimously supported my motion calling for asylum seekers and refuges to be treated with respect and dignity and declaring that seeking asylum is a human right. All sides of the NSW Lower House have afforded refugees and asylum seekers the respect and dignity that current – and former – federal governments have failed to. It is time that the federal government and opposition stop the race to the bottom, and acknowledge the negative health and mental health impacts of their expensive and inhumane off-shore processing policies. For those interested in the full transcript of Alex Greenwich’s motion – here it is (taken from Alex’s website). (1) Acknowledges the contribution made to New South Wales by those who have sought asylum, refugees, and other immigrants including those on 457 visas. (2) Notes that seeking asylum is a human right and asylum seekers, refugees and other immigrants should be treated with respect and dignity. (3) Notes that the Sydney electorate has one of the highest numbers of recently arrived immigrants and that they have made a significant contribution to the social fabric, multi-cultural mix and economic activity of Sydney and New South Wales. 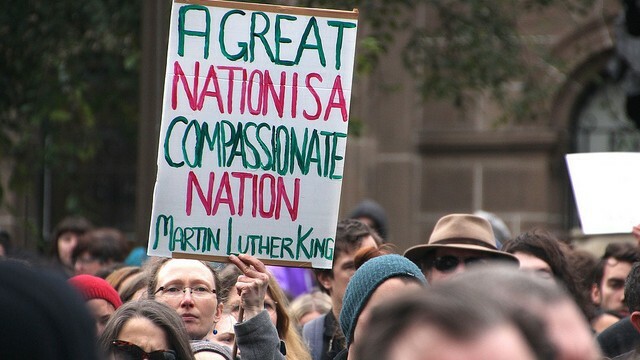 Many Australians feel disgraced and disillusioned by our deteriorating treatment of asylum seekers. Australia is the only country in the world to mandate the strict enforcement of detaining asylum seekers. Mandatory detention began in the early 1990s under the Keating Government. It contravenes our obligations under the UN Convention on the Status of Refugees. In 1999 the Howard Government extended the time asylum seekers were detained and introduced temporary protection visas. In 2001 the Howard Government introduced the Pacific Solution which prevented asylum seekers landing on Christmas Island, sending them to Nauru and Papua New Guinea to be detained without the protection of Australian law. While the Rudd Government abandoned the Pacific Solution and temporary protection visas when coming to power in 2007, in 2011 Australia began swapping new asylum seekers with refugees in Malaysia but this practice was ruled unconstitutional. In 2012 the Gillard Government reintroduced offshore processing and reopened the Nauru and Manus Island detention centres. In 2013 the Rudd Government introduced the Regional Settlement Agreement in which asylum seekers assessed in detention offshore found to be refugees get settled in Papua New Guinea. The Abbott Government’s practice of using the Australian Navy to intercept boats and turn them away from Australian waters puts lives at risk and causes immense distress. The recent history has truly been a race to the bottom by the major parties – it is a national disgrace. I was deeply saddened by the death of 23 year old Iranian asylum seeker Reza Barati on Manus Island. Reports indicate he died after being beaten by several detention centre officers. Others were seriously injured during two days of riots. Investigations and charges are the responsibility of the PNG police yet there are allegations against police for partaking in violence. The situation highlights the tension and distress caused by prolonged detention, and offshore processing and resettlement as well as the problems caused by outsourcing our responsibilities to countries with different laws and accountability measures and do not have the infrastructure and capacity to ensure adequate processing and resettlement. Following the death, about 15,000 people attended candlelit vigils at 750 sites across the country in protest against immigration policies. Candles bring light to dark, symbolising the need to shed light on what happens in offshore detention centres. We should have strong policy and practices to stop people smuggling who exploit asylum seekers and put them at risk but this should not be at the expense of desperate and vulnerable people. Asylum seekers may not always be able to apply for passports or exit visas from their home country where they may be attempting to escape persecution, torture or other forms of inhumane treatment. Escaping can put their and their families’ lives at risk. I am particularly concerned about LGBTI asylum seekers given there are 70 countries that punish with imprisonment, and five countries and parts of two that have the death penalty, for homosexuality. The number of boat arrivals depends on conditions in countries from which refugees flee. It is estimated that processing asylum seekers in Australia would cost 20 per cent of what it costs to process them offshore. Each asylum seeker processed offshore costs Australian around $1 million when infrastructure is taken into account. This money could be better spent on humane solutions such as increasing the capacity of the United Nations High Commissioner for Refugees to process asylum seekers in Indonesia quicker with faster resettlement. The majority of asylum seekers who have reached Australia by boat have been found to be legitimate refugees. Australia has been settling refugees for over 170 years. My father was a refugee who moved to New Zealand after World War II and I often meet refugees at local citizenship ceremonies that I try to attend. The Sydney electorate has one of the highest numbers of recently arrived immigrants. In fact, almost 83 per cent of Sydney Electorate residents were born overseas and almost 90 per cent have one or both parents born overseas. Immigrants have made a significant contribution to the social fabric, diversity and economic activity of the inner city and New South Wales at large. I am proud of this country’s multiculturalism and refugees are a big part of that mix. Australia must honour its international obligations and allow people to seek asylum here and not punish them for their mode of arrival. All legitimate refugees who seek asylum in Australia should be resettled here. I hope the house joins me in calling on the Federal Government and Opposition to treat asylum seekers and refugees with the respect and dignity that they deserve.